It is sometimes necessary to limit a variable in order to maintain safe operation or protect process equipment. If this variable is a function of the system’s primary controlled variable, the two variables can be interlocked in an override system. The primary variable maintains control as long as the second variable does not exceed its safe limit, at which point the second variable assumes control. 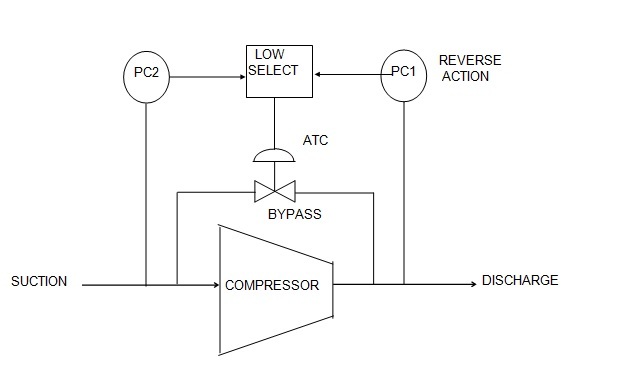 In the compressor control system shown below, discharge pressure is controlled by PC1 manipulating the bypass valve so long as suction pressure remains above its low limit. However, when suction pressure reaches the limit value, PC2 takes over control and holds it until normal conditions are re-established. The take-over in either direction is through a low selector and is both bumbles and automatic. Both controllers are proportional plus reset and must have external feedback from the selector output (not shown in the figure) for smooth take over. In this example, the suction controller is direct acting , the discharge controller is reverse acting and the valve is air-to-close. Other examples include reactor temperature control with pressure override and compressor discharge flow control with discharge pressure override.